Help break the cycle of low cost, low end garment manufacturing that takes the most out of the environment and gives the least to the hands that make it. Allmade t-shirts are made from recycled plastic bottles and organic cotton, sewn in Haiti for a living wage, with proceeds going to support orphan prevention and care. T-shirts made from recycled plastic and organic cotton, sewn in Haiti for a living wage, with proceeds going to orphan prevention and care. Each shirt contains the equivalent of 3 plastic bottles. Cotton is grown, spun, knitted, dyed, and finished in the US. 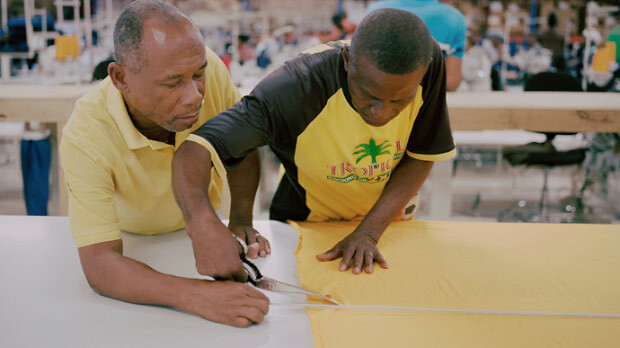 Shirts are sewn in a modern facility in Haiti for 5x the going wage. Minimal shipping (US:Haiti:US) reduces ocean pollution. Proceeds benefit the Global Orphan Project.